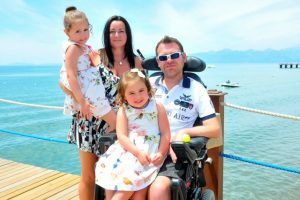 Following on from his epic trip to the top of Mount Snowdon MOTIONrehab® client Jason, who suffers from Motor Neurone Disease, now plans to abseil from the Humber Bridge. Abseiling off the Humber Bridge is not a feat many would dare to brave, but for Jason Liversidge, it is the latest in a line of daring stunts he has completed to raise awareness of the condition that has virtually paralysed him. The money will be divided between the Motor Neurone Disease Association and the Fire Fighter’s Charity.